When ordering games for yourself, or when you use our bulk order fulfillment system you may qualify for bulk pricing. Discounts start at 10 copies of a game for approximately 5% off, and can go up to as much as a 35% discount at 100 copies. Each game is a little bit different. Some components have a fairly fixed cost even at large volumes, so not all games will qualify for a full 35% discount. You can see a full breakdown of all the bulk pricing intervals in our game editor. Click on "Bulk Cost Each" to see your bulk cost at different quantities. Note: The bulk pricing is based on the number of games in a order not the number of sheets or number of games worth of items in a single game. To see the exact bulk pricing available for your game, you would need to first create the game in our system (start a new game and add the number of components to it; this is due to the fact that bulk pricing varies depending on the components in the game. 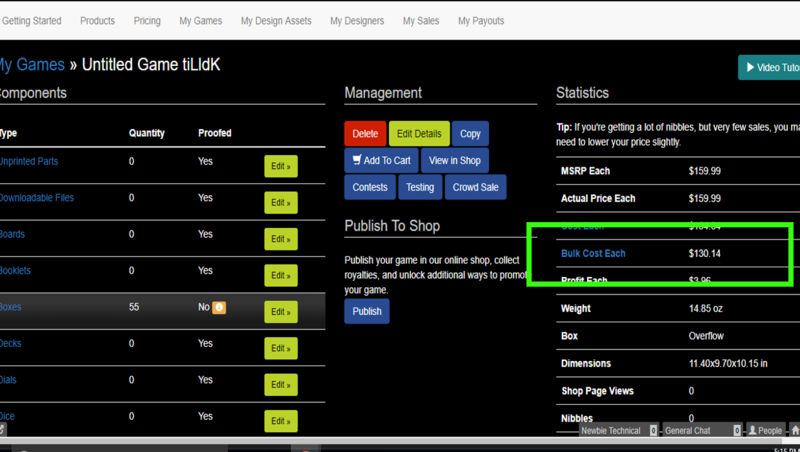 You can then click on "Bulk Cost Each" in your game to see the pricing available at various quantities.